It’s often difficult to find a time when my husband and I can get together with our daughters. They both have very busy lives, so when there was an opportunity to have breakfast with them at the local Walker Bros., we jumped at the chance without even checking to see what gluten free options they offered. Happy surprise! There is a good GF menu at the restaurant. Besides the egg dishes, they offer a number of GF pancakes and waffle delights. Walker Bros has several locations in the greater Chicago area. I had long been familiar with their original restaurant in Wilmette. 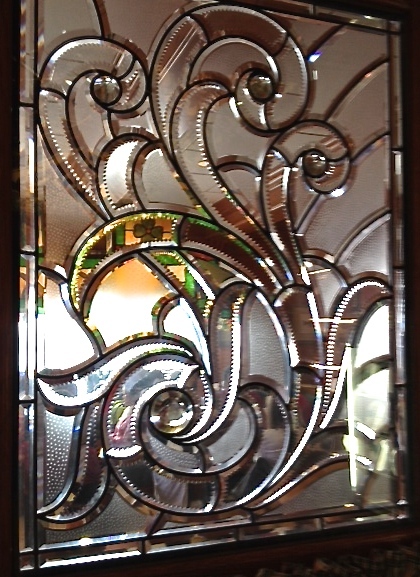 Besides their fine reputation for pancakes and similar food, the restaurants are well-known for their incredible stained glass windows and lighting fixtures. There is always something wonderful to look at while you are at Walker Bros. You could say it is a feast for the eyes, as well as the stomach. We ate at the Lake Zurich location. Most of the GF pancake and waffle items included fruit – blueberry, strawberry, etc. 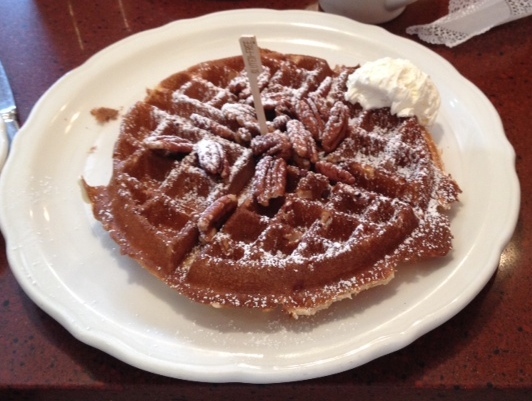 It had been a long time since I’d had a pecan waffle, so that was my choice, with a side of turkey sausage. A whipped butter is provided, along with little jugs of syrup. The table for our party of six (daughters, granddaughters, husband and I) had a number of these little pitchers, along with cream jugs. It’s such a nice touch to be served fresh cream in a jug, rather than in a packaged plastic container! My pecan waffles were wonderful. They didn’t lose anything in the translation to gluten free. Texture and taste were excellent. My husband had French toast on challah, and he said it was also excellent. For your dining companions who are not gluten free, Walker Bros menu has many very tempting dishes. Now that I’ve become aware of the great GF choices offered at Walker Bros, I’ll definitely be making a point of going there more often. Daily hours are 6:00 a.m. to 9:00 p.m. This entry was posted in Restaurant Review and tagged fruit, gluten free, pancakes, pecan waffles, stained glass windows, waffles, Walker Bros on April 19, 2014 by goforsix.